We spent our last two nights in Chicago as the Runyans' first guests to try out their new airbnb basement redesign. The redo is beautiful and we always have fun sleeping in our old queen bed that we gave to them when we moved to Quito! (It's a whole lot nicer than our used mattress here.) It was sweet of them to set that time aside. I love how graciously Ella and Edie invite our kids into their lives and rooms and toys and more. We started out with a trip to the River Forest Pool where everyone but me slid down the waterslides about 20 times. I opted for lounging on a beach chair. I think I needed a break from the hustle. We did dinner at Katie and Bill's which was fun and full of good, drawn out stories from Bill, and the time together was much too short. 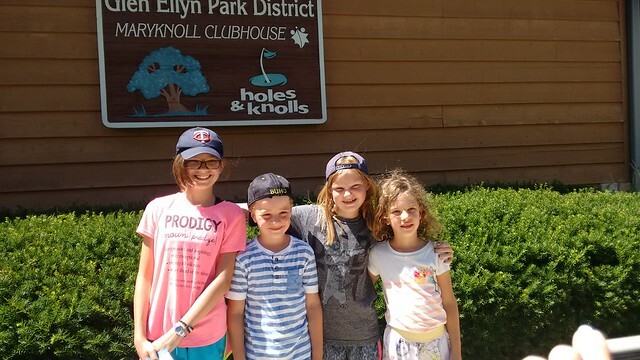 We continued our tradition of mini golf and had a much more successful trip with the kids actually following (mostly) the rules of golf and no meltdowns. I had a much less successful day and believe I came in dead last after last year's win. But what I really enjoyed was talked to Emily about bullies and how they've hurt our friend's kids and having her get so upset on behalf of people she's never met. It's one of my favorite things about her. We had such a fun game of soccer in the backyard with Edie, Canaan, Eric and Nate playing while Ella played the role of announcer. Seriously one of my favorite parts of this trip was witnessing Ella as a preteen. I just admire how witty she is and how she does a masterful job of staying just one the right side of not being disrespectful to her parents but being dry and funny. The guys also spent the good part of a day putting together a trampoline that had just arrived. 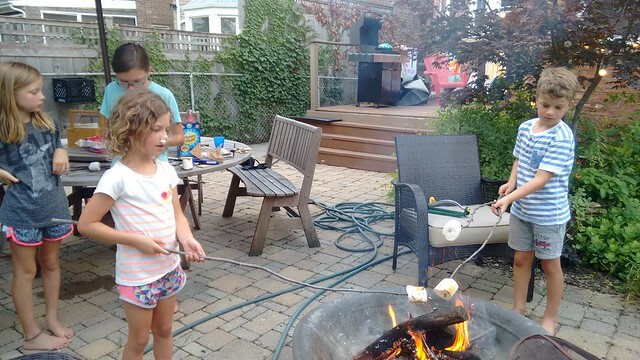 We had grilled salads for dinner and sat around while the kids made roasted marshmallows. And we had a night reading through our enneagram subtypes and listening to Nate share how meaningful the relationship with Eric and Em has been for his own growth. And then it was the rush and hustle of packing and yet another goodbye and yet another airport for us.